Are you aware of how many people are killed due to U.S. drone strikes? Josh Begley wants you to smell the coffee. About six months ago, the NYU grad student and internet artist set out to tweet every drone strike ordered by the U.S. He tweets the strikes on Dronestream, an account he created. Now this service is accompanied by the Dronestream API. The tweets are haunting in their frequency. 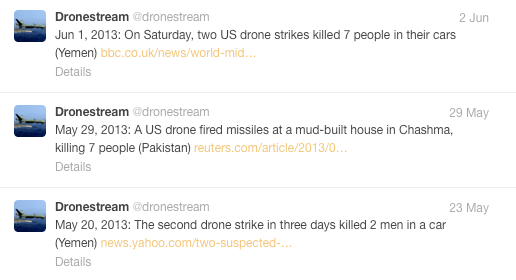 Each unmanned aerial robot attack is accompanied by a death toll and a news story reporting the strike. Begley wants to shake us out of complacency and he is using social media to do so. Now he has released an API that offers real-time and historical data about every reported U.S. drone strike from 2002 onward. Begley hopes designers and developers will use his API to create visualizations on the covert war. You may have read about Begley in the past. When he first began frenetically tweeting drone attacks last December, his efforts garnered significant news coverage. Begley’s tweets followed on the footsteps of an iPhone app he created called Drones+ that would send users a pop-up notice for every U.S. drone strike in Pakistan, Yemen and Somalia. The app never got off the ground. Apple blocked the program from its App Store multiple times on the grounds that the content of was “crude and objectionable,” even though the app was simply republishing news stories. The data comes from the UK’s Bureau of Investigated Journalism, which tracks various news organizations for every strike. The launch of Begley’s drone strike API comes on the heels of a recent speech on terrorism in which President Barack Obama promised tighter regulations on use of drones in places such as Pakistan and Yemen.